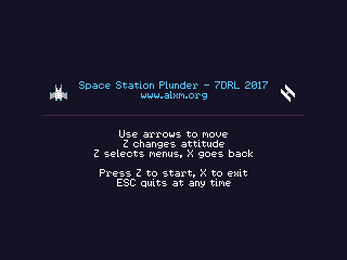 A space roguelike game made for 7DRL 2017! Fly your ship around different space sectors, battle other ships, mine asteroids, and trade with merchants. 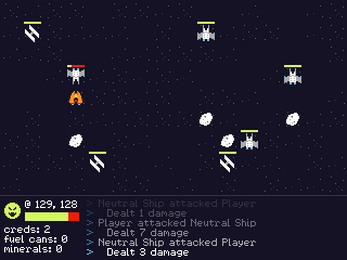 Use the arrow keys to move the ship around. Move into things to interact with them. Press Z to change your attitude toward others when interacting with them. 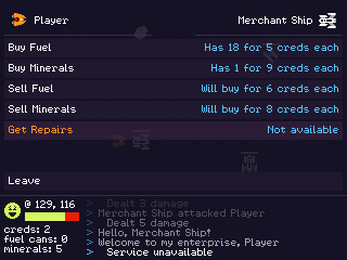 Use the arrows to navigate menus, Z to select an item, and X to go back.